Some sixty complete routines are performed and explained! As far from a "one trick wonder" type offering as can be imagined, when you get the series you are just paying one dollar and thirty-five cents per routine. 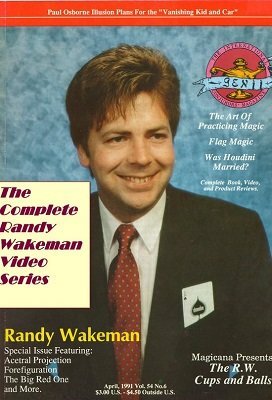 This is the complete set of all four vintage Randy Wakeman instructional videos. now available by download for the very first time. It includes performances and thorough explanations of most of the pieces from Randy's first trilogy of books ( Formula One Close-up , Randy Wakeman's Special Effects , Randy Wakeman Presents ), Randy's Linking Ring Parade, Randy's Genii issue, Randy's one-man issue of Harry Lorayne's Apocalypse . . . and much, much, much more. Originally selling for over $150 on VHS, you can now get them all right here for a mere fraction of the original price when you buy the complete series. It is a huge amount of material, memorable close-up you'll enjoy performing . . . and your audiences will love watching. This is well over 6 hours of performance and instruction. No details are left out.